Its that time of the year again, Labor Day... the beginning of fall. The most welcome time of year in Texas because the temperature no longer spikes in the triple digits, and the mornings are a balmy 77 degrees. We joyously make plans for fall wardrobes. Break-out our winter sweaters (short sleeved, cotton of course) and our winter coats (in cotton and you guessed it, short sleeved) and move those tank tops and shorts to the second drawer. 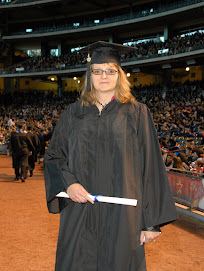 Time to put away your white tank dress and bring out the black one with the cap sleeves. 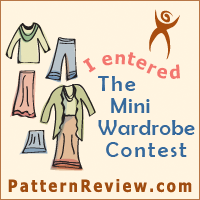 The patternreview.com wardrobe contest begins September 1, and this year there are 4 garments required for the month. Surely I can put together 4 pieces, right? I already have 2 of the 4 pieces laid out, all I have to do is hold off on cutting until Sunday. The pants are my go to pants pattern from BWOF 7-2009 as seen here. I made 3 pairs back in 2009, but I've worn the lining out of all 3, and one pair has a hole in the seat. So, I took apart the pair with the hole and laid them out on 3 different pieces of fabric. I have navy, black pinstripe and gray. The black pinstripe should go with the wardrobe. Marfy 2314 was suposed to be with last years wardrobe, but I lost the pattern... this year I plan to make it with the shorter sleeves, in red polka dots from Fine Fabrics.com when she had a rare sale. This lays uncut on part of my HUGE desk at work. Being able to sew at work is a great incentive to bring lunch and not go out and over eat. 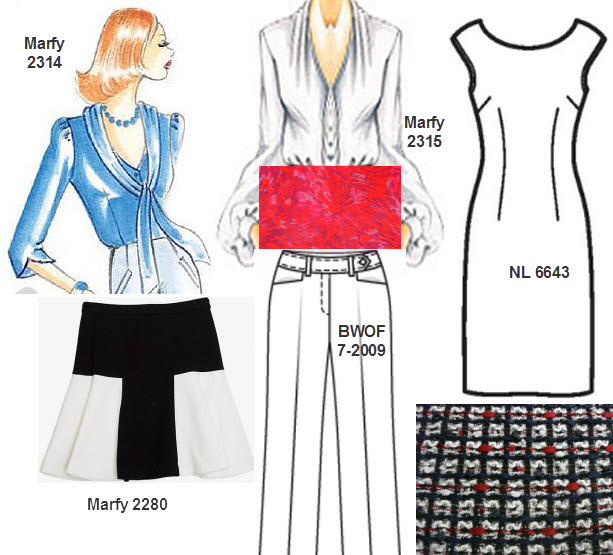 The other blouse is a metamorphasis of Marfy 2315 with the left side duplicated. I like the drape on the right side, but I'm not sure how well it will wear. For the picture above I sliced the drawing in half and pasted 2 left sides together. I love the red chiffon with shear sleeves and red underlay for the body. The skirt is Marfy 2280, my first one is in navy leopard on the right. I love this skirt, super easy and I will even shorten it a couple of inches. It will look good blocked in black an white (as I grabbed from Pintrest). I love the tweed for the dress, especially if I can work out some black leather or red trim. We'll see, its pretty bulky. That's it for the wardrobe plans. Last year I completed 2 out of the 4 garments, this year I'm shooting for 3! Love your plan and look forward to seeing the final pieces. I'm still trying to work out my plan. Love the fabrics! :) And love a wardrobe plan. I really need to be a better planner, I far too often fly by the seat of my pants...good for you to have a plan! Can't wait to see all of your makes! That's a great looking wardrobe plan - I have yet to try a Marfy pattern but they look to have such great details. Look forward to seeing your sewn garments! I like your wardrobe plans! While you are planning for autumn, we are getting excited about spring/summer... YAY!! for the changing seasons and the excuse to sew some lovely new clothes!